Welcome to my monthly series where I share my blog stats and income with you. I was inspired to do this because I know of some bigger bloggers (like Pinch of Yum) who share their blog stats and income but I really didn’t see any smaller bloggers (like me! and maybe you!) who do so. I figured if I was looking for something like this, others might be as well, so I decided that I’d start sharing my monthly stats and income. 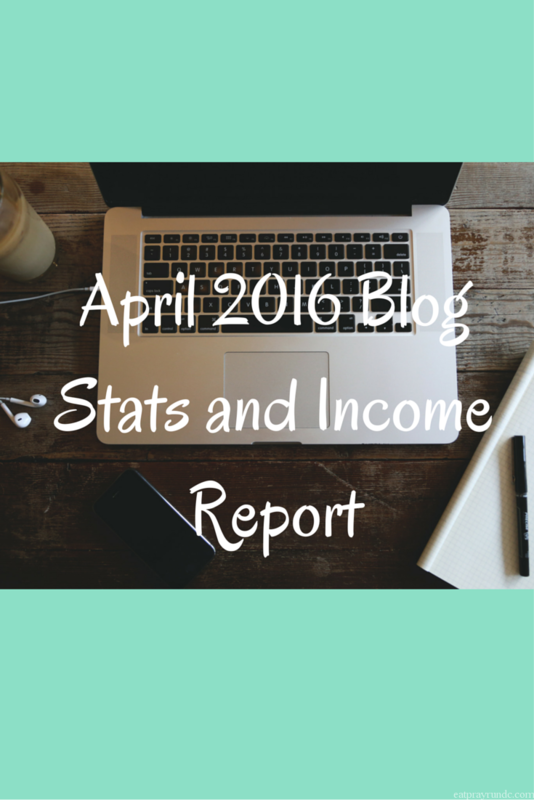 Here’s my April blog stats and income report – I hope you find this helpful (you can find March’s report here)! I did not have a lot of realized income in the month of April – just my ad networks paying out. Remember, I count my income in the month I actually receive it – not when the work is done. This means that if I have a sponsored post that goes live in April, but I don’t get paid until June that income counts for June not April in my accounting system. In March I had a realized income of over 500 and May will be another good month but April was a bit of a lull, which is cool. Summer is coming, which usually means a dip in pageviews but I’m looking forward to a bit of downtime in terms of blogging and planning and getting set up for fall. Which sounds ridiculous, but if I don’t plan ahead, it won’t work. I will probably move to a two day a week blog schedule over the summer – but I haven’t definitively decided yet. I read this good article on preparing for the summer slump that some of you might be interested in. Hansons Method Training Plan: a Review. People were curious about the Hansons plan and so this post got quite a bit of traction. Between Now and Marathon Training. In this post, I talked about my plan for my off season in between Shamrock Half and the start of marathon training. Cherry Blossom Ten Miler Race Recap. Cherry Blossom is one of my favorite races so I was thrilled to write this recap – I also scored a new ten miler PR! This past month, my top three referral sources were: 1) Facebook; 2) direct and 3) google. For the second month in a row, my Pinterest referrals were down and Facebook was huge. I don’t pretend to understand how all this works so I won’t really speculate. But I will say that while I have no clue about all the Facebook algorithms, I’ve stuck with it and had a few posts go viral on Facebook. I think the best social media platform to promote your blog is the one you will use. I utilize Facebook a great deal and have started engaging less on Pinterest – not purposefully (because I really love Pinterest) but it’s just how it’s shaken out. Pinterest is still a very important part of my blog promotion strategy – but the recent volatility with Pinterest is a good reason to diversify your strategy and not have all your eggs in one platform. Bloggers: do you experience a summer slump? If so, how to you deal with it? I’ve found I blog less in the summer just because life gets in the way, but I hadn’t given much thought to purposefully reducing the frequency of posting. I actually really like that idea – I’m definitely going to consider it as I plan out my summer. I find for me being intentional about it works better. Thanks, as always, for sharing! I actually never really paid attention to my blog stats until I switched to a self-hosted site, so I’m paying more attention to it. I will probably switch to a less-frequent posting schedule when my training starts in July. I would actually love a post on how you use Facebook. I don’t use Facebook at all personally, and I set up a page for my blog but never did anything with it so ended up deleting it. If I don’t like Facebook and don’t use it, I’m guessing it’s not worthwhile for me to try to start something up again, right? So true about staying diverse with traffic sources and income too! Pinterest is still my top traffic driver, but it isn’t nearly what it was last year this time. I’m trying to focus on changing what I can and using new strategies to engage my email list and FB community. Yes, it’s always tricky and I just try to roll with it 🙂 You’re doing great! You’re doing great, Courtney. Keep up the great work! It will all pay off! Thank you for sharing! I can’t wait to keep following along in your journey! I also share income reports so it will be really nice to see how far we get in a year or so! I will be sure to stay tuned here! What a small world. I found you listed in another bloggers income report. The title of caught my eye because I follow you on Instagram (chris_runforlife_fff). Is Instagram helpful to you at all in a business sense? Every blogger starts out small. Way to have the courage to document your journey from the start.